Designs by Lisa Somerville: Happy Mail Day! Look what I received in the mail from my BFF! Isn't it just beautiful! 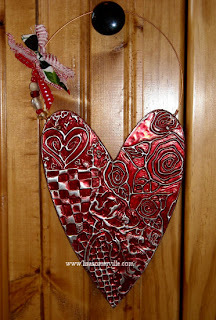 The red metal is all embossed and attached to a wooden heart form. I just LOVE all the detail and love put into this piece of art! Wow!! What a lucky girl you are! Very cool. I can see I'm going to have to give this a try myself.